How does branding prove the case for a growing law firm? For many competing firms in Hawai’s, branding appears to be an afterthought. While several of Goodsill’s competitors had recently made small refinements to their branding, their incremental efforts left the door wide open for this esteemed firm to make some noise and establish a unique brand position in the Hawai’i market. Recognizing this opportunity, they reached out to Stackpole, and make some noise we did. You can’t be a legal presence in Hawai’i for more than a century without becoming an integral part of the culture- or unrivaled experts in Hawaii’s laws. Goodsill’s history of Quality and integrity was second to none, but times change, competition increases and forward-thinking firms realize the importance of brand evolution. Stackpole helped Goodsill take full advantage of this chance to out- brand and out-shot the competition, and to enhance its image as Hawai’i’s premier law firm. One simple brand statement would represent the direction of our new integrated Strategy. Hawai’i Life. Hawai’i Law. A world-class website for a world-class law firm. “Hawai’i Life. 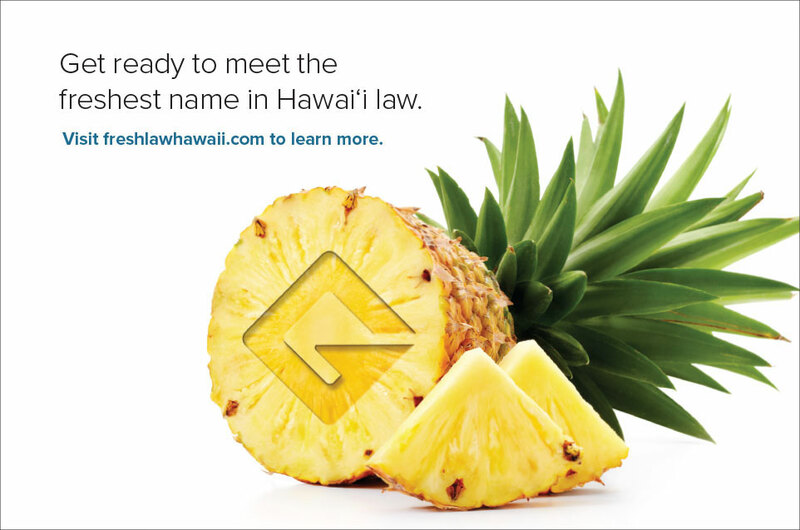 Hawai’i Law.” comes alive on the firm’s new website. 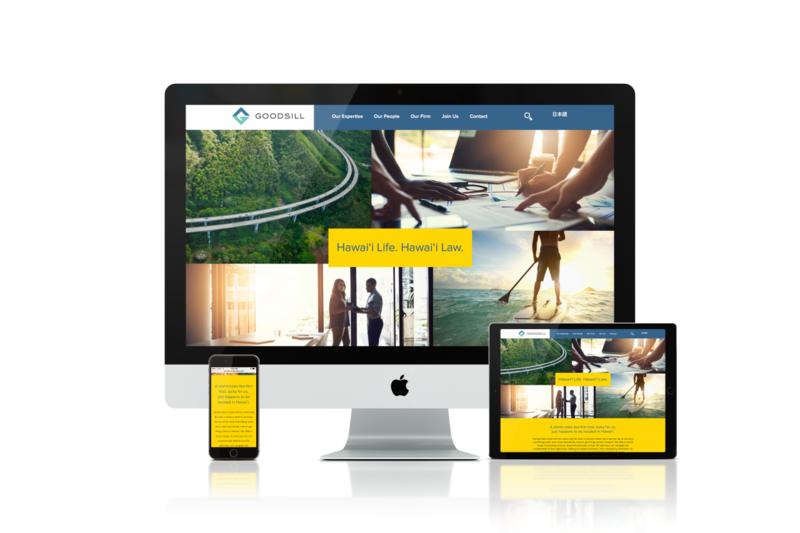 Simultaneously reflecting the beauty and vibrancy of Hawai’i culture and Goodsill’s newly developed brand image and positioning, the interactive, SEO-optimized site delivers the distinction the firm was looking for. Goodsill’s history, experience, and expertise are compellingly on display, sending the clear message that they’re ahead of the game and continue to be Hawai’i’s premier law firm. To build anticipation for the new branding. Stackpole crafted an innovative print and digital teaser campaign that introduced Goodsill’s new mark and hinted at the bold imagery to come- but kept the firm’s name under wraps, for the moment. To avoid spoiling the reveal, readers were invited to freshlawhawaii.com where they were then directed to our newly designed Goodsill website. 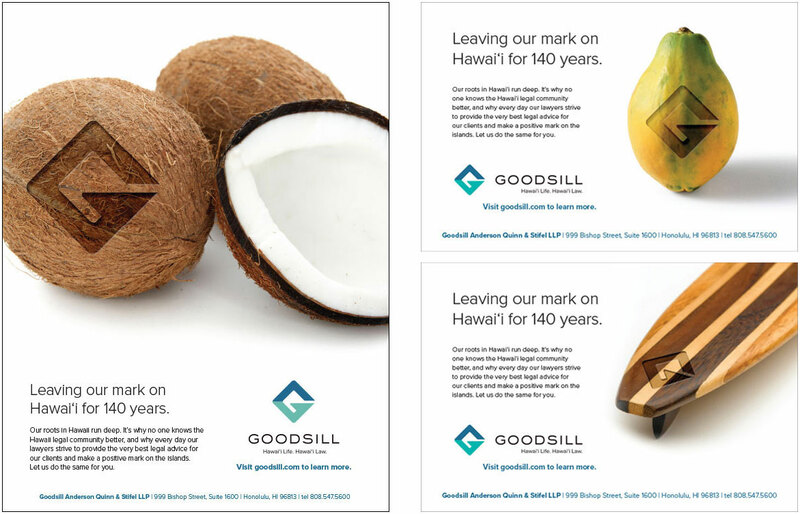 By investing in their brand and going to market with a strategically sound and well- choreographed campaign, Goodsill has shown intent to compete and created clear separation from their Honolulu competitors.